When I found out I would be traveling to London on business and that I would arrive on Saturday not starting work until Monday, the first thing I did was go to the Context Travel website to see what I could book for Sunday. There right before my eyes was Gastronomic London beckoning and I promptly signed up. The weather was supposed to cloudy with sprinkles, but for the second day in a row, it was absolutely gorgeous and therefore a beautiful day for a walk. The last time I was in London was with Mr. Misadventures in May of 2009. We stayed in the Piccadilly area lodging at Le Meridien, a Starwood property (since we are loyal SPG members) which turned out to be a nice little area to spend my first weekend in London. It is made for gourmet foodies. This trip as it turns out that Piccadilly is very close to the Pall Mall area where my office is, so I am staying at another Starwood property, the Park Lane Hotel, which is right across the street from Green Park and very convenient to where I met my docent for our first stop on the tour. 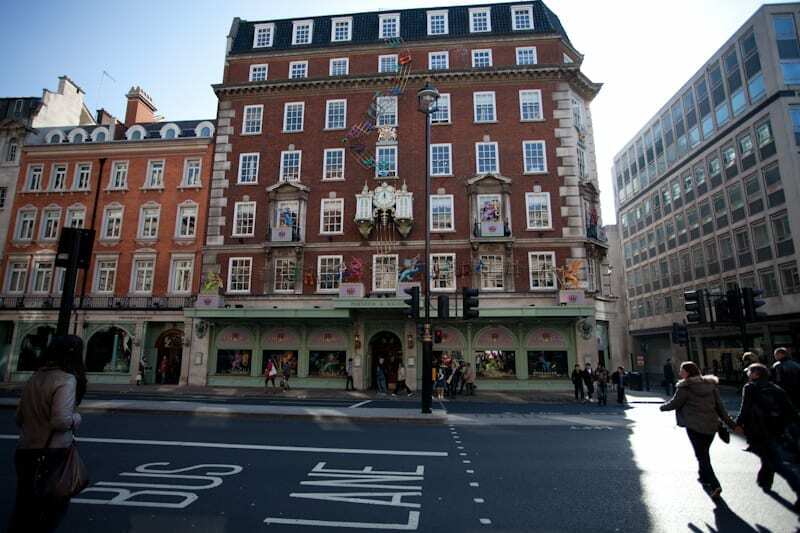 I actually walked past Fortnum and Mason the day before my tour and was dumbfounded by the fact that it was only a half-block from Le Meridien. During our trip every time Mr. Misadventures and I walked out of the hotel we turned left towards Piccadilly Circus and therefore completely missed this giant food mecca. I am certain we must have passed by it on the last trip but we were likely having a deep discussion (planning our next meal no doubt) because I cannot believe I didn’t see the ginormous building which houses the food purveyors that have been supplying the royal household since 1707. This building is hard to miss! Inside is a foodie’s fantasy with little departments dedicated to sweets, pastries, teas, biscuits, coffees and fresh food staples like cheeses, deli items, and meats. And since Fortnum and Mason started the concept of hamper it is a requirement that they sell all the supplies you would need for a lovely picnic in any one of London’s parks. There is so much history around this one store that you could spend an entire tour there, but sadly we had to move on. 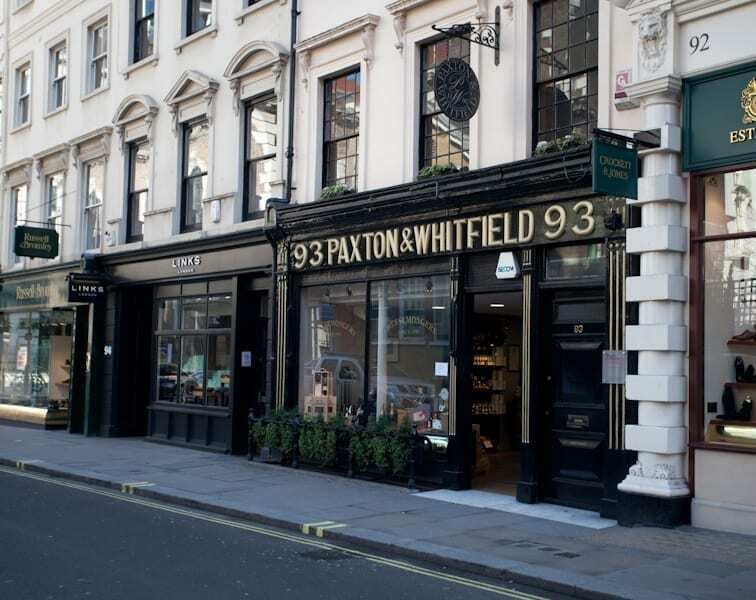 Our next stop was the oldest cheesemonger in London which opened in 1797, Paxton & Whitfield. Again, another location with quite a history. It was actually begun by a Mr. Sam Cullen who became partners with Paxton & Whitfield, but I guess they muscled him out. They began supplying the royal household in 1850 and for some time became a regular grocery store during the World Wars when cheese became scarce. The store is adorable and has a large variety of continental cheese, a focus the store turned to when cheese in London became an industrialized product (much like what happened with bread in France). Later they moved back to carrying a large selection of cheeses from the UK including Ireland and Wales. This part of the store is entirely native cheeses, who says the British don’t have good cheese? Our next stop was the Japan Center which for me was very much like the Japanese grocery store in Japantown in San Francisco and my very own Japanese Fish Market in Berkeley. The Japanese embassy is in the Piccadilly area and there are lots of Japanese restaurants in the area as well. Also, oddly enough, the only other two locations for Fortnum and Mason are in Tokyo! The food in the Japanese store looked heavenly and when the tour ended an hour later I headed back here for some fresh gyoza, sashimi, and milk tea! But before that, we crossed over from Piccadilly to SoHo, an area known for immigration. 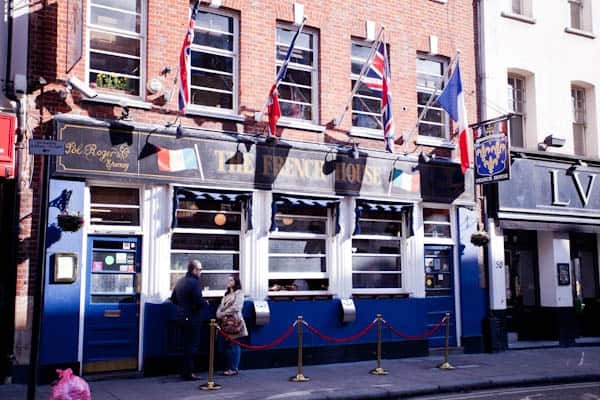 It started with the French who came to London in exile escaping religious persecution. Then many Italians arrived during a second wave of intense immigration. There are a ton of French and Italian restaurants throughout the district in addition to many, many other varieties of food. In fact C,hinatown (the second one) butts right up to SoHo as well. We visited The French House where some of the Free-French were exiled during World War II. It was a spot the Charles de Gaulle would often be found. It is tiny inside and while it may look like a pub, it is actually more of a wine bar. 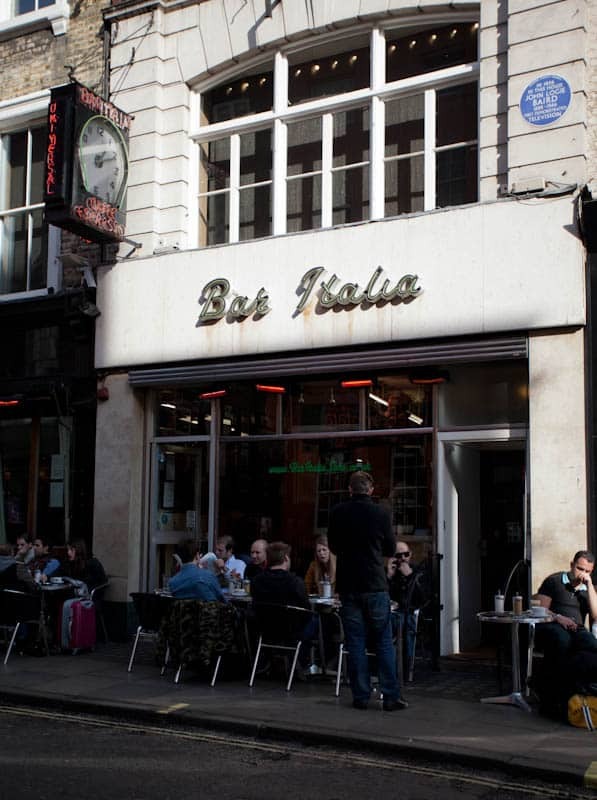 We then moved onto to Bar Italia. 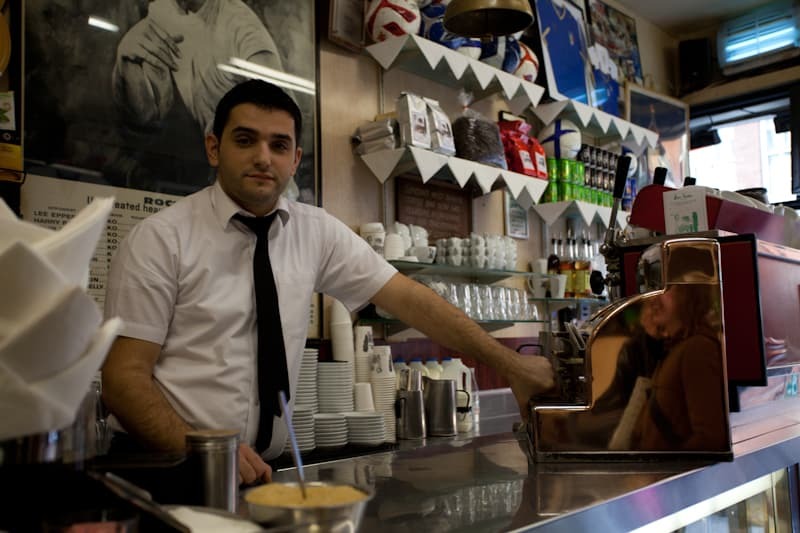 A 24-hour truly Italian coffee bar. I was excited upon seeing the spot as by sheer coincidence I had just finished watching the London episode of Anthony Bourdain’s The Layover on the plane over. I had two episodes of the show to watch and did not even realize that one was London. 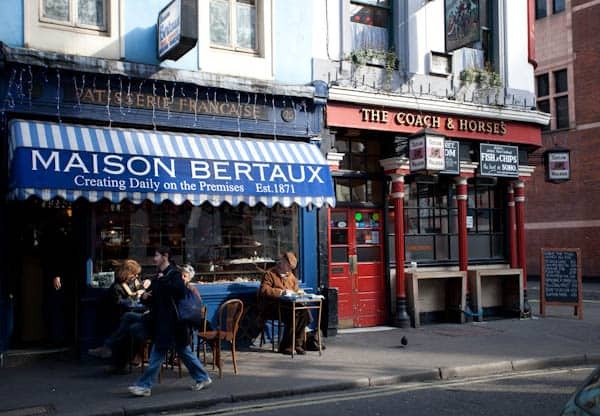 In any case, in that episode, Anthony met a restauranteur friend, Fergus Henderson at this location for a coffee (see the photos from the show, image #3). Inside looks exactly like an Italian coffee shop and all the people in there (except one waitress, the same who served Anthony coffee in The Layover episode) are Italian and there is no messing around, they are serious about their coffee and serve a mean prosecco! They ought to as they have been open since 1949. We visited a few other places in the area with each location having its own unique history. I could spend weeks just in this one little area discovering all its secrets. The thing I like most about it is how all the cultures are mixed in so harmoniously, it is something that you rarely see in many cities. Generally you will see a Japantown or a Chinatown (and London does have these) that have only that one culture’s shops and restaurants, but in SoHo all the regions are mixed and it is delightful! Here is just one example. 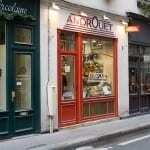 This French patisserie here in this spot since 1871 sits right next to a classic English pub. They co-exist tremendously. You can start your day with a croissant and an espresso and end it with fish and chips and an ale! We ended at the entrance of Chinatown and I walked through it a bit heading back towards the Japan Center for lunch. The tour was great, a nice way to get to know a little part of the city, kill time when you are alone, and to enjoy the magnificent weather. – Unlike the food tours in Paris, there is no actual eating, so make sure you have a proper breakfast or lunch prior to your tour start. 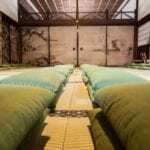 – Try not to book a tour on Sunday that involves going into stores or restaurants, many are closed and you won’t get to go inside. 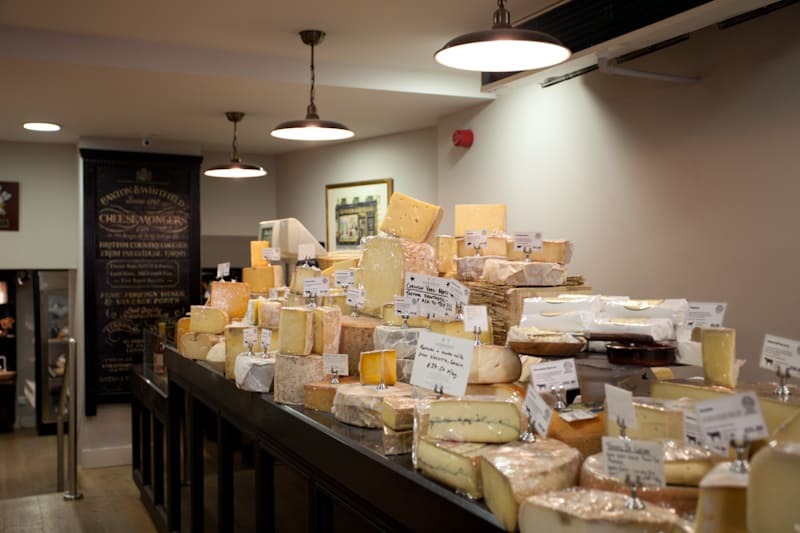 The Gastronomic London tour is another fantastic Context Travel tour and I am so pleased to share my experiences with you because I would HIGHLY recommend this activity for you on your next trip to London (or if you live there, do it, you will discover areas of London that you aren’t familiar with, promise!). 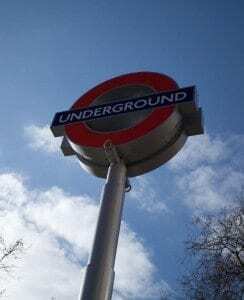 For more info on Context Travel tours in London, visit their website. London is not the only location that this amazing company operates tours in. I say amazing as Context Travel is a company that practices and deeply believes in sustainability, they have even created the Context Travel Foundation for Sustainable Travel and operate as a certified B Corporation a relatively new kind of company which uses the power of business to solve social and environmental problems. These are extremely important initiatives to me and I am happy to promote and support Context Travel by spreading the word! I really wanted to spend much more time exploring London. I have been there twice for business and would love to go back. I’ve got the perfect 2-day London itinerary from my friend Greta, so I’m all set, now I just need a plane ticket! How about you? Have you been on a food tour while on vacation or a business trip? Tell me about it! @Kasia, definitely do, you MUST go to Bar Italia, especially with your Italian! p.s. I would have wanted to go on that food walk! Sounds like great tour. I have added this to my list of sites. Thanks. 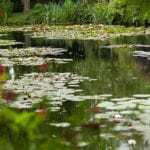 Thhank you so much regarding givkng mee an update on this theme onn your web page. in case any changes occur on the current publication, I would be interested in reading a lot more and learning how to make glod usage of those methods you write about.